★ XJ Tech strongest flexible hose makes life easier! When dragging your clumsy hose to water your lawn, it's not easy, especially when struggling to coil it up and take it back to storage. Now our upgraded expandable hose offers a solution. It's lightweight, flexible, leakproof, kinkfree, and very easy for women and kids. It's fun to see it automatically expands and retracts by itself like a magic. Your wife, your kids and your pets will love it so much. ★ Why XJ Tech Expandable Hose is Better? Our hoses is made of 100% pure natural Thailand latex , which could be used more than thousands of times. Others may only last 600 times. Our brass fittings are about 1.4 oz heavier than other brass fittings on the market. They have the highest durability. Unlike other plastic or brass ends, our brass ends with nickel plated connecting part prolong hose life by stopping oxidation between latex and metal or plastic. Our 3750D polyester fabric works better than 5000D fabric (easier to be snagged) in actual use. And it's 5X stronger than the old version fabric. 1. Store in cool and well ventilated place. 2. Drain the hose after use. 3. Keep away from harsh winters. 4.Water pressure: 4bar-15bar ( 6 bar for first time usage), fully open the faucet may help get a full expansion of the hose. 5. Optimal Working Temperature: 32°F-140°F. 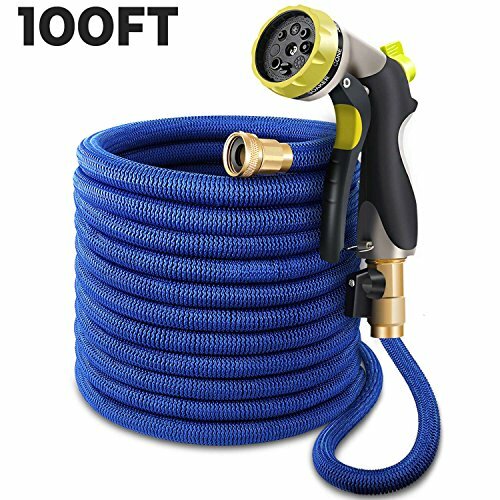 ★Package includes: 1 x 100ft expandable Hose, 1 x manual, 1 x storage bag,1 x 8 Pattern nozzle, 3 x spare gaskets (random color,black or white). ★ Guarantee:12-month manufacturer's guarantee. For any product defect just contact seller with a picture attached. ★Certificates: SGS, CE,SVHC, and BSCT. Risk-free! STRONGEST AND DURABLE: Improved for 2018 with the latest techniques and best materials. 5 times stronger than ordinary expandable hose. Anti-burst, anti-leak. EASY TO USE: Automatically expands up to 3 times and contracts back in seconds by water pressure. Never kinks or tangles. Very compact and light weight! MULTIPLE USE: Suitable for garden watering, car washing, pet shower, floor cleaning and so on. Just one in all. A great gift for you. A BONUS ADDS IN: 8-mode zinc alloy spay nozzle. Much sturdier and 3 times more expensive than plastic nozzle. 8 functions cover all your needs. 12 -MONTH MANUFACTURER'S WARRANTY! --- For any manufacturing defect just contact Seller for a replacement or a full refund. No risk at all! Sales price for $45.99! That's a huge bargain for that quality! 24/7 customer service is available. Add to cart now! If you have any questions about this product by XJ Tech, contact us by completing and submitting the form below. If you are looking for a specif part number, please include it with your message.